Woke up early, but did not get on the road early. We had to wait for the ATM to be stocked with cash. Due to the delay, we didn’t end up leaving Creel until around 9:30am. About a half of an hour after leaving, we happened upon the really small town of Cusarare. The waterfall of the same name was our first diversion. 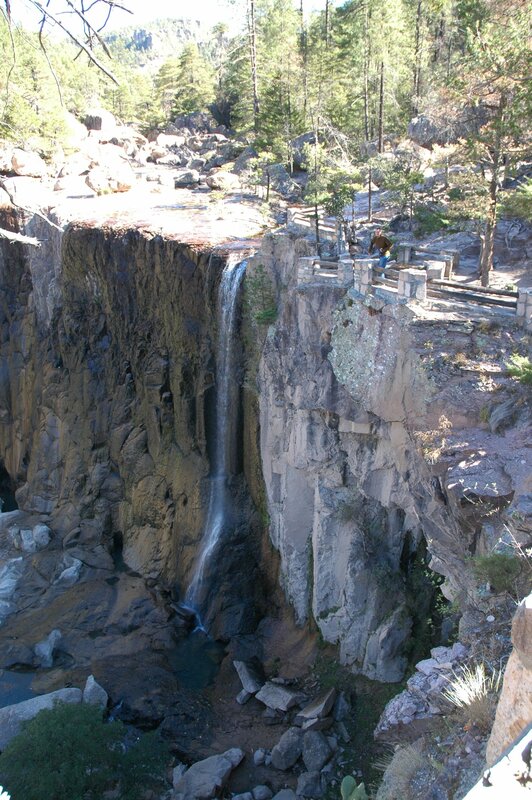 It took us a couple of turn-offs to figure out which dirt road led to the falls. We drove about 10-15 minutes, had a small river crossing, and ended up in a picturesque, wide bank. Continuing down the windy, paved road offered our first view of the scale of the canyon. 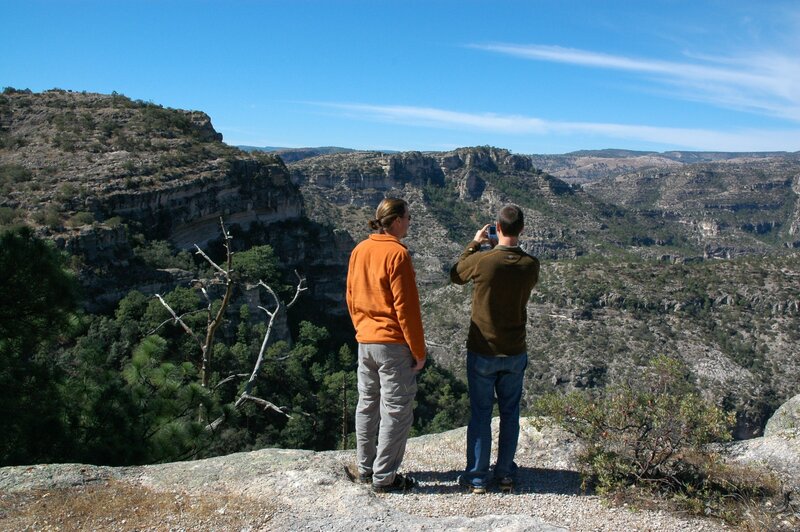 This was one of several vistas that rivaled the views that we have seen of the Grand Canyon! Eating lunch here seemed like a great idea. So, we did. We ended up talking to Gary (UK, early 90’s BMW GS) and ??? (US, KLR650) for an hour. They were returning to Creel after two days in Batopilas. We got the “lie of the land” for the city of Batopilas which was down at the bottom of the Batopilas Canyon. We discussed things like the conditions of the steep route down to the bottom, places to stay, and sights to see. Of course, the five of us talked about our travels thus. The most interesting discussion item was the “new road” to Urique. I got excited! Here’s why: Batopilas to Urique is only about 14 miles apart (the way he crow flys). Since each town is on its own river of the same name, that means up and over a mountain range. I did as much research as I could before we left to find out if a drivable route even existed. 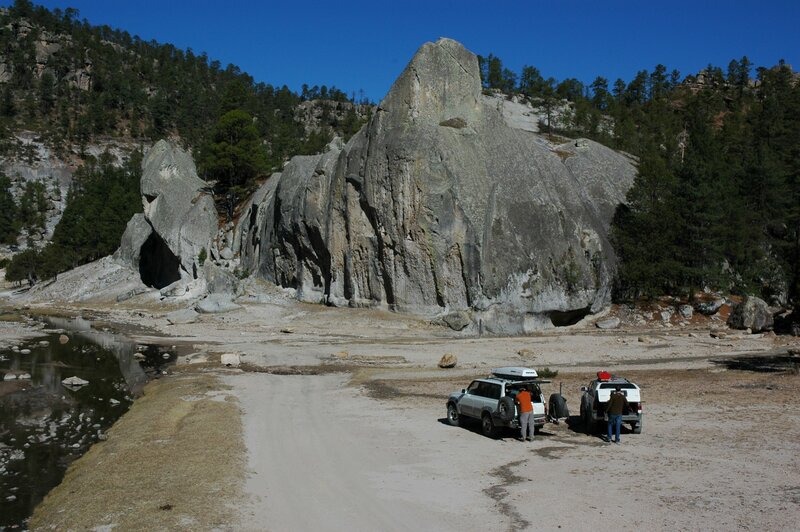 Unfortunately, Expedition Portal was of no help and the Copper Canyon tourist websites catered to tour packages. I did look at Google Earth and it seemed there were ranching roads that would go most of the way. But the tracks disappeared under trees, so I was still uncertain. Gary and ??? said they scouted the road but did not take it. Since it was so new (read as not yet hard packed) and Gary was a novice dirt roader, they bailed on that route. Hence, our meeting on the pavement. This is why I was excited – a new road that (presumably) very few non-locals had taken and one that was not easy to traverse! It was about 2pm that we parted ways with the DS riders. Soon enough, we were to the dirt road that would lead down from about 7400 feet to the 500 feet elevation of the Batopilas River. As there was active, heavy construction occurring on the road, we had to wait about 10-15 minutes while the road was built before us before the construction crew would allow us to pass. The road down was neat. Many switch backs were visible from the top. Only one car at a time was able to traverse the narrow road in many locations, so care had to be taken to look far ahead for oncoming traffic. The vistas on the way down coupled with the setting sun made for some good pictures. It took over an hour to descend the almost 7000 feet. After that, it was another 15 miles and another hour following the river. La Buffa – a petrified sand dume for lack of a better analogy – was worth a ten minute rest and a few pictures. 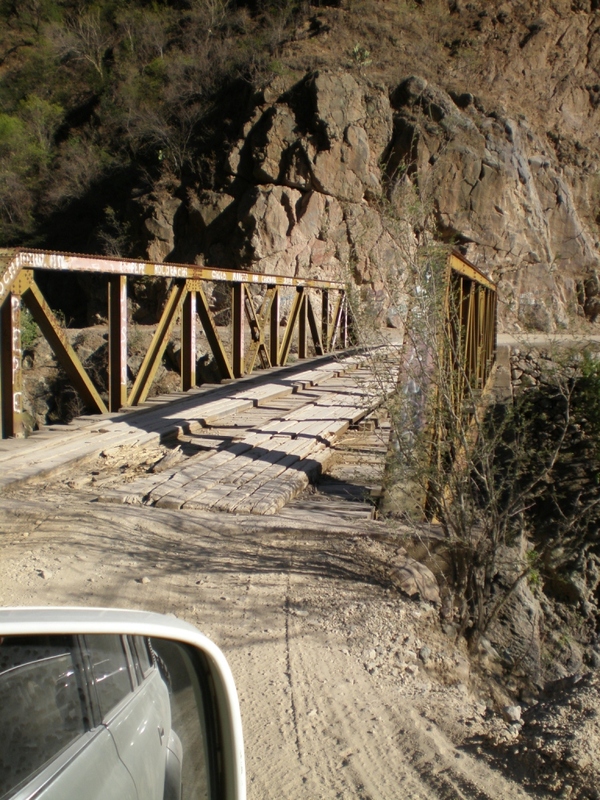 The couple of times we had to cross the river, there were bridges which were basically a steel superstructure with wooden planks. We made it to Batopilas with about an hour of daylight left. The most striking aspect of the city was its narrowness. For a good portion of the town, houses on each side of the road defined it width. At its widest, it was two blocks. The roads were also narrow. In more than a few sections, another vehicle and my truck could not pass each other. Could a Unimog make it? I wouldn’t want to try, but probably? I say this since I think that some earth moving trucks had to get through the city at some point to get to the towns beyond. A small trailer (like an AT Chaser) would probably make it with some skill and if a place could be found to turn around. Please note I have never driven either a Unimog or with an over landing trailer. When we pulled into the Zocalo area, we immediately met a guy named Lino. We were able to figure out he was a guide. We tried to ask him about the new road and if he could guide us, but we’re unsuccessful in our communications. He told us there was one guy in town who ran the museum, Rafael, that was able to speak English. We went on a quick search for him. No luck – the museum, was closed. Since it was now twilight, we attended to the more pressing matter of finding a place to stay. We ended up staying at Hotel Mary. 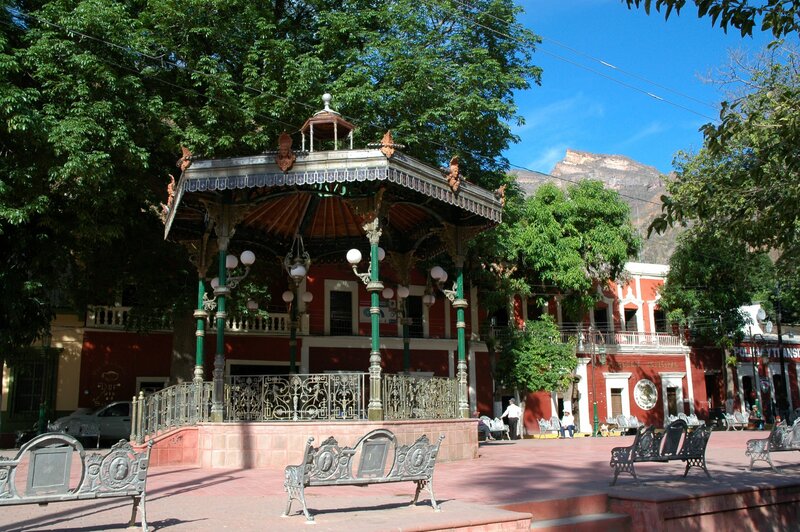 It was located right across from main church, a block north of the zocalo. It was really inexpensive at 300MXN (22USD) per night for the three of us for three beds. It had secure (fenced in) parking for the trucks, a shady little courtyard, and a basic, but tasty restaurant. OK, now the bad: It was not very clean (i.e. a few dead cockroaches and mouse droppings on the floor). We think the brown shower/lavatory water was the same for every place in town. Maybe it was straight river water? It did seem that at least some waste water drained directly into the river. As we walked along the bank, we’d see some white PVC piping suddenly shoot out a column of water and then stop. I not recommend setting foot into the river without more information on its sanitation!